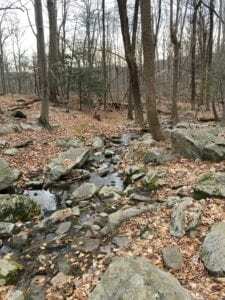 This is part 23 of excerpts from the trail log which was located on a New York portion of the Appalachian trail. For the post which explains this series, click here. You can read all the previous hiking posts by clicking here. Whether you are running from the demons that are nipping at your heels OR you are chasing Truth over the next Ridge, You will find peace on this trail my friend. The benefits to walking in the forest have included lower blood pressure, improved short-term memory, lower stress levels, lower levels of inflammation, less fatigue, depression and anxiety and better focus, to name just a few (!). And that’s just from walking in the forest, with no particular reason except to be there. What our hiker of the day seems to be pointing out though, is that there could be something internal driving us to take that hike through the woods. And whether we are walking to something, or away from something, or whether we are trying to escape something bad or find something good, we can. All we need to do is put on our hiking socks, get our hiking shoes and backpack on, and get out on a trail.